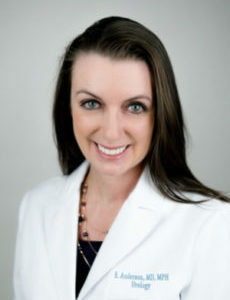 Dr. Erin Anderson, originally from Virginia, completed her undergraduate studies at the University of North Carolina at Chapel Hill and graduate studies at Tulane University's School of Public Health and Tropical Medicine. She finished her medical degree and residency at the University of South Carolina at Columbia. Dr. Anderson is certified by the American Board of Urology and specializes in the Geneveve procedure by Viveve, a non-invasive vaginal rejuvenation procedure that takes only one session.